Landscape artists Gregg Wapner and Ailyn Hoey recently combined their work in a two-person exhibition at the Riverview Cafe. The combination of two distinctly different manners of working was good, both harmonious and mutually supportive. Both of these artists received their training locally and through personal exploration in previously unfamiliar media. Both seem to have found a natural foothold in their respective medium. The show featured some views which jibed with the natural phenomena beckoning just outside the restaurant's windows, that view of the river for which the cafe is named, its islands and foliated shapes. Brattleboro art enthusiasts are steeped in representations of the local river landscape, those floating ghosts of Island Park which flock around the iron bridge territory between here and Wal-Mart. We've seen these subjects portrayed in passion and expression, and maybe even affectation: a place where quiet mystery and native memories float like canoes or hover like humidity on the summer face of the Connecticut; a place where leafy, isolated masses describe hazy and mysterious shapes. Much sentimentality has been eliminated in a landscape which cuts right to the essence of such a mountain and its reflection in the painting "Connecticut River" by Gregg Wapner. The simplicity of vision and technique are the substance of this composition, a view of land and water that show painter Wapner has developed a maturity in his use of selection, strong and simple. Strong and simple. The word is out, in fact, that the artist received a compliment in person from local watercolor master David Rohn. It is said that while visiting the Zephyr Designs frame shop, where Wapner is employed, Rohn spied one of Wapner's watercolors on display. After inquiring into its creator, Rohn told Wapner to "go back to making pastels because I don't need the competition." In this neck of the woods, a compliment like that is hard to beat. But perhaps we can say that another painting of Gregg's at the Riverview lit up all of the lights on the watercolor pinball machine. "Clouds Rising," a watercolor on paper, is a horizontal composition, 38"x24". It depicts the view west, looking towards the north branch of the Deerfield River from Gregg's boat, floating or perhaps trolling in the Harriman Reservoir. That is the persepctive of many of his compositions. "Clouds Rising" is an afternoon view focusing on the sky. A low horizon allows some land in from the sides; the foreground shows the effect of light on the clouds. On one hand, they describe a billowing action rising up in a manner which gives a feeling of expansion and of great space. On the other hand, these clouds are fresh, spontaneous, yet descriptive shapes, true to the toughest principles of watercolor. One thing which is truly amazing about this artist is the fact that he is basically self-taught. A workshop with Jean Pratt Fisher, which he admitted to, seems to have armed him with his apparent enthusiasm. He has a natural predilection for the traditionally noble and romantic idealism of the landscape painter, and this spirit is conveyed through his work. Before the French Impressionists, painting depicted mostly kings, popes, history and myth, and, of course, religion. Once Van Gogh had hiked through his first pair of boots, Paul Cézanne had fallen in love with one mountain and Pissarro and Monet had catalogued all of the precise hues of nature, painting had changed itself. It kicked off the collar of commission and was reborn as a wandering philosopher and naturalist: A Basho, a Nolde, an Ansel Adams. Gauguin brought sensuality to painting, Kandinski wild riders surmounting a hillside of expression. The Hudson River painters brought the landscape right into the hall (and charged admission at the door). Georgia O'Keeffe brought us back to bare bones. Landscape is the place where we walk free. It is physically everything that surrounds us and metaphorically everything that we feel. Every great story begins in a landscape and every landscape painter's life is a story. It is the story of man in nature. Ailyn Hoey, studied art at the River Gallery School here in Brattleboro. She has also taken various area workshops geared toward specific media. Her recent works in charcoal show a natural understanding of that medium and convey a deep and mature expression, as well as a "mood" which is consistent. Hoey, who also studied at Putney Village Arts with Dennis Sheehan, has worked in different media, including oil paint, but seems to have found her natural means in her explorations with charcoal on paper. A medium which she finds "both bold and subtle" is deeply expressive in her hands. She uses her fingers "to do the blending" and uses the eraser as a drawing tool. As a rule, Hoey does not use a highlight, in other words, she uses only charcoal and lets the paper show through as needed: This rule was broken only in the piece entitled "Clocktower," a view of Bellows Falls from the north. In this piece, the Bellows Falls clocktower is seen in the distance while Fall Mountain enters from the left. The addition of a white line can be seen on the clocktower itself. Deeply moody and softly brooding shapes populate her compositions. The delicately rubbed edges of the dark expressive masses give a Rothko-like touch as mist and distance lighten the value of the receding shapes. The best description of her landscapes could probably be found in Sir Arthur Conan Doyle's Hound of the Baskervilles. Not only does her style lend itself to hazy hills and waterways but the softness of the charcoal seems equally appropriate in her studies of the Western desert. In "Storm Breaking," we see the Texas landscape. The soft expressive nature of the charcoal infusesthe gathering clouds. There is a large feeling of emptiness as foreboding is personified by the weather. The invitation for the exhibition featured a piece entitled "Breaking Front." It shows a somewhat symmetrical group of hills fading as they create the horizon in the distance. These hills are rendered with black charcoal in subtle value shifts. They are potato-like shapes, that is, rounded and fuzzy edged. The light they reflect is soft and fading. The counterbalance to these shapes can be found in the calmly gestural lines which describe the reeds in the foreground. Two reeds near the center gesture upwards like hands beckoning to the sky. In other reeds we sense their nature, thin and frail; they dance on the breeze. In such a setting, a loon's lonely cry would sound at home. This is the scene Van Gogh would have witnessed as he fished around at sunset, looking for reeds to cart home, where he could sit down and hand-carve his own reed pens. Another piece by Hoey, " Into the Light," shows a fern peeking from beneath the sunlit rocks. 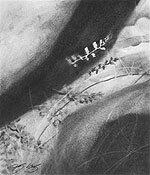 Seen from above, this small desert "vignette" is yet again imbibed with a quality that the artist is finding and refining in that substance which was left in the fires of a Stone Age human and has been at our fingertips since long past memory: a stick of charcoal. Both of these artists have made strong statements in the language of landscape in their recent showing. Each has discovered, by fluke, that artist's tool which seems ultimately appropriate for their respective sensibilities. They are both deeply involved in mature explorations. For Gregg Wapner, it is watercolor. For Ailyn Hoey, it is charcoal. Editor's Notes: Gregg Wapner has donated his painting "Clouds Rising" to the Brattleboro Memorial Hospital's annual Clambake and Auction fundraiser scheduled in July. Ailyn Hoey is in this summer's Member Show at the Southern Vermont Art Center. She is preparing for a solo show this fall at the Sharon Art Center in Peterborough, New Hampshire, with an opening scheduled for October 18. And in March 2005, she will have a solo show at the Goodrich Gallery in Dallas, Texas.